Companies like Hot Toys are known for their incredibly realistic action figures, but you can only pack so much detail into a toy that’s 12-inches tall. 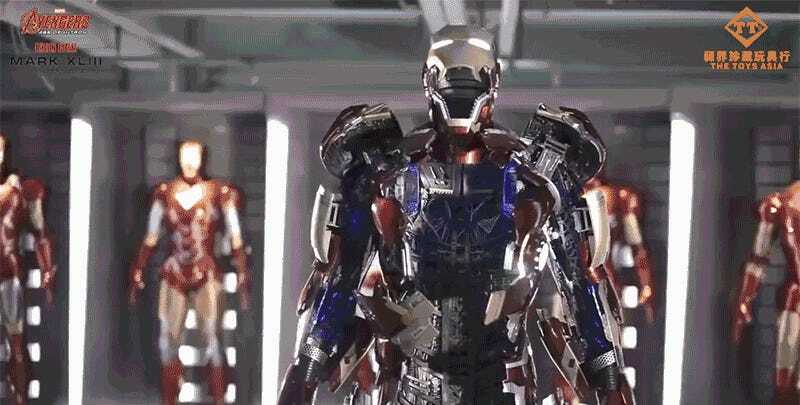 So a Chinese company called The Toys Asia has taken the concept of an action figure to a whole new level with a life-size, fully-animated version of Iron Man’s armor. At the push of a button on the included remote control, this Iron Man figure completely opens up to allow Tony Stark to step inside—at least in theory. Once the 28-second long, incredibly satisfying transformation is complete, you can see all of the suit’s inner details that are rarely revealed on a smaller action figure. But as a result of there being some 567 individual parts that make up this collectible, there’s not quite enough room for someone to actually climb inside the armor. That might be a little disappointing after you’ve spent 2.5 million Chinese yuan to add this to your collection, which works out to just shy of $360,000 in US currency. But after waiting eight months for it to be delivered, the last thing you want to do is accidentally break it. The figure also includes its own display stand, since there’s no way you’re going to fit it on a shelf with your other toys. And if you thought Iron Man was expensive, just wait until his command fortress playset is available for pre-order.